Our first introduction into the Uribe Riverside rods was the M2, the most multi-purpose oriented rod in the company�s lineup. 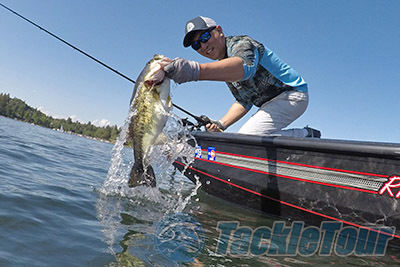 Over the course of the last four months I fished the Riverside M2 rods targeting largemouth bass in Northern California lakes and the California Delta, primarily pairing the rod with a Shimano Bantam reel spooled up with either Sunline FX2 braided line or Sunline Shooter fluorocarbon. 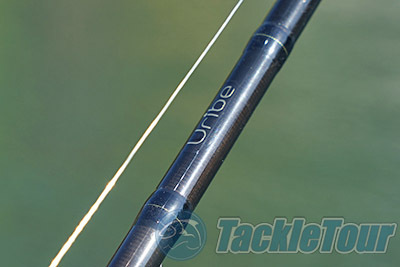 Casting: Before we get into the performance specifics on the Uribe rods let�s take a closer look at the rod�s overall design. The first thing you notice about the M2 rod is the clean overall build. 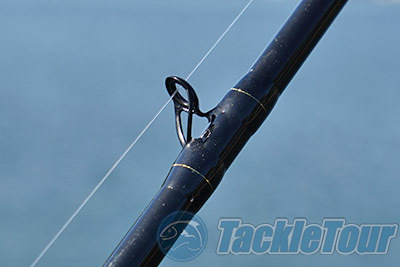 This is not a flashy rod, and though the twisted guide layout is clearly noticeable the company doesn�t go out the way to call attention to the guide wrap with use of shiny frames or bright threading. The overall styling of the M2 rod is both simple and clean, and makes use of a gloss black blank with the brand�s logo and threading highlights in gold. The split handle design of the rod makes use of a combination of Portuguese AAA cork in the main grip and EVA foam in the foregrip and rear grip sections. The reel seat is very similar to those found on the Daiwa Zillion, with a flanged design that provides plenty of access to the blank. This real seat design has always reminds me of a squid, and though aggressively styled is comfortable to hold with even the lowest profile baitcasters locked on. With a Shimano Bantam reel paired with the rod it still felt like a reasonably lightweight and balanced rig, though an even lighter baitcaster would add to the overall light weight feel of the rod. 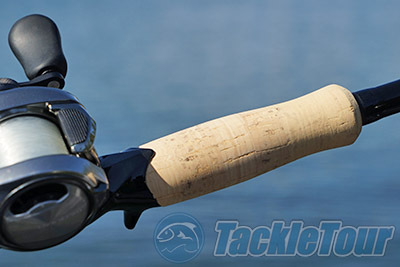 I found casting with the twisted guides just as good as any normal rod, and though the reduced guide count theoretically should reduce casting friction I wasn�t able to achieve any measurable distance increase versus a similarly rated traditional configured casting rod. 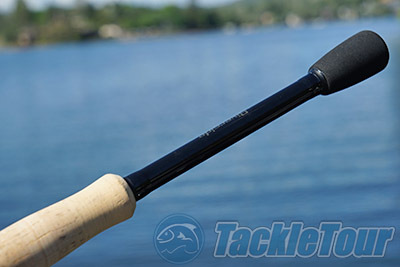 Overall the M2 is just as good of a caster as any traditional wrapped rod when it comes to distance, and casts with the M2 felt both smooth and accurate with the X-Fast blank action and light crisp tip. Retrieve: I fished a variety of baits with the M2 rod and felt that the rod was more multi-talented than the specifications imply. 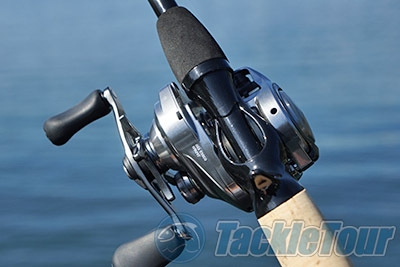 Rated with an X-Fast action and lure weights from 3/8 to 3/4oz. I found that this rod was good at handling the lighter range and excellent at the top end, even handling reaction baits in the 1oz. class. I was able to cast and retrieve these baits with ease and the blank didn�t overload when setting aggressively or fighting larger fish. This is due to not only the blank design but the spiral wrap. The M2 blanks are composed of 5% Boron Fiber this helps with rigidity, weight, and sensitivity and the company also added a bit of Zylon Fiber to make it more lightweight and rigid. They then blended 36T and 24T Toray Carbon Fiber to compete the matrix and bond it all together with a nano resin. This unique blend of materials translates into a surprisingly powerful and sensitive rod at this price point, in fact I found this rod as sensitive as some rods costing nearly 100 dollars more! It took me multiple trips to really discern the differences between this rod and others in various performance attributes, and what makes it feel so responsive. Ultimately I believe that there are three primary factors that combine together to give this rod a unique feel and better than average sensitivity. This includes the use of the boron fiber in the blank mix, as boron fiber better transmits vibration than traditional carbon fiber. 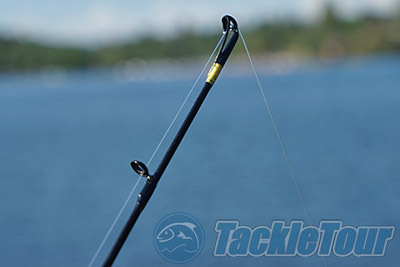 A second factor is the use of lightweight ceramic guides, and fewer of them, which helps make the rod feel even lighter.